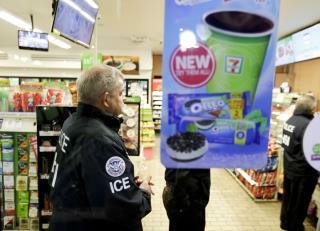 (Newser) – US immigration agents descended on dozens of 7-Eleven stores before dawn Wednesday to open employment audits and interview workers in what officials described as the largest operation against an employer under Donald Trump's presidency. The AP reports agents targeted about 100 stores nationwide, broadening an investigation that began with a 4-year-old case against a franchisee on New York's Long Island. The audits could lead to criminal charges or fines over the stores' hiring practices. The action appears to open a new front in Trump's sharp expansion of immigration enforcement. Derek Benner, a top official at US Immigration and Customs Enforcement, said Wednesday's operation was "the first of many" and "a harbinger of what's to come" for employers. He said there would be more employment audits and investigations, though there is no numerical goal. "This is what we're gearing up for this year and what you're going to see more and more of is these large-scale compliance inspections, just for starters. From there, we will look at whether these cases warrant an administrative posture or criminal investigation," said Benner. Though agents arrested 21 people suspected of being in the country illegally during Wednesday's sweep, the action was aimed squarely at management. THIS is how you deal with illegal immigration go after and charge those that hire them. Go after the CEO's as well. This is effective on ALL illegal immigrates. Dry the well and they won't come. A middle finger to California for forbidding law enforcement officials from enforcing immigration law. What is really sad is that it took them this long to just stop at any 7-11 and figure it out for themselves.